Okay, I couldn't resist giving this post a sensationalistic title, but this news is really quite interesting. 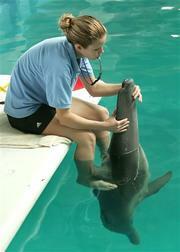 An injured dolphin named Winter lost her tail fin when it got caught in fishing wire. What used to be the tail is now just a stump which she desperately swishes from side to side to keep moving. Her handlers are concerned that she will suffer in the long-term from spinal damage if it's not corrected. So, marine scientist Steve McCulloch and Dana Zucker, chief operating officer of the Clearwater Marine Aquarium, want to do something about it, namely by getting Winter a prosthetic tail fin. Zucker has put together a team to discuss the prospects of designing a tail for Winter. They've consulted with a diving gear manufacturer, a tire company and the Navy, which has experience attaching items to dolphins for military research. From an engineering perspective, the task will not be easy. "The dolphin's tail fin is the most powerful swimming mechanism Mother Nature ever designed," McCulloch said. "When you see how much pressure they put on their flukes, the prosthesis is going to take a marvel of modern engineering." Compounding the problem, Winter's tail flukes and peduncle, a wrist-like joint that allows a dolphin's tail to move up and down, were lost to necrosis. It's not immediately clear to the team how the prosthetic tail should be attached to her stump, but it will have to be tough. I hope to see updates as this project develops.